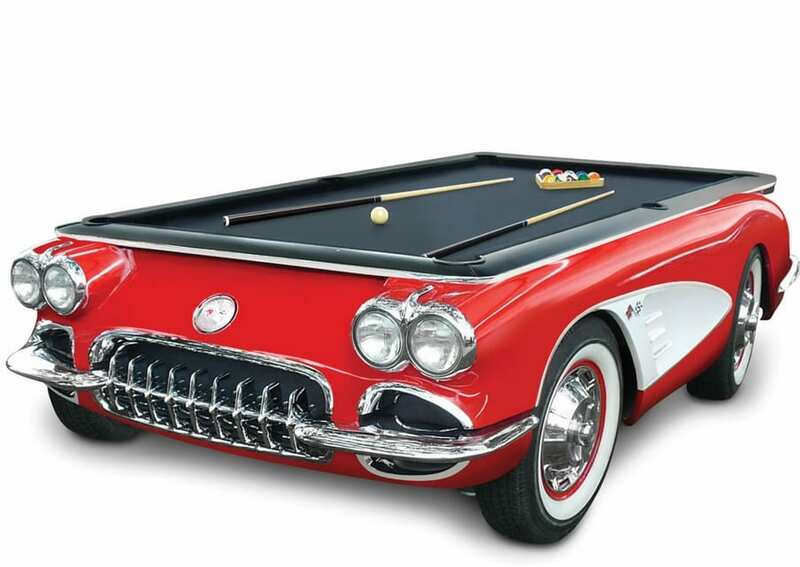 This is the regulation billiards table whose base is molded from an original 1959 Chevrolet Corvette. Built in the U.S., the table meticulously reproduces the classic convertible from real chrome bumper to real chrome bumper, complete with gleaming grille, curves, and working versions of the trademark four headlights, which illuminate with a remote control. The four full-size whitewall tires have genuine steel rims and chrome covers ornamented with spinners, and authentic details include crossed racing flags in the cove area and Corvette emblems on the hood and deck lid. Finished in an auto body shop, the car is painted the original ’59 Roman Red and Snowcrest White, shellacked with a layer of automotive clear coat, and hand-buffed and polished to a brilliant shine. Above the car is a tournament-size 4 1/2′ x 9′ pool table with a three-piece, felt-covered 1″-thick slate surface for impeccably flat, professional-caliber play. The table has solid hardwood rails, dense cushions for quick rebounds, and six drop pockets.